WESTERN STAR #4 CALIFORNIA SCIENCE FICTION NEWSLETTER ---- Portland and the NORWESCON have came and went. Now tis memory and history. We now look ahead to New Orleans and perhaps next time to Detroit then to the Bay Area. We hereabouts are definitely setting our kites for 1953. Word is that the 1953 Convention, if we get it, will be the LEPRECON. A NOTE ON POLICY... At Portland, Bob Tucker's talk on fan news periodicals included a sharp criticism of those irresponsible fan publishers who callously insert opinion into their columns of news. We agree with Bob that this practice is both widespread and reprehensible. However, we feel a statement of policy is necessary with regard to this publication. We do not aim at direct and exclusive reportage --- our desire is rather news commentary. We shall present the news with our own interpretations --- so be forewarned. 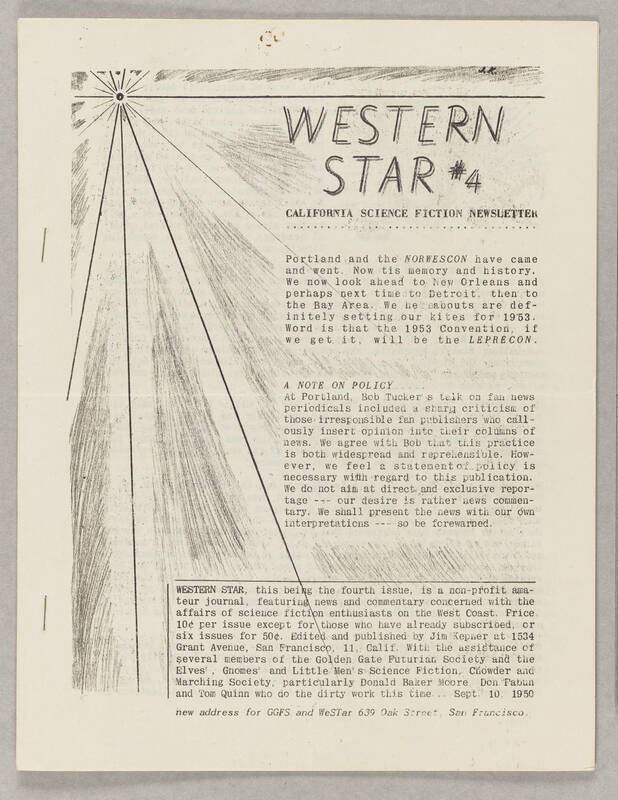 WESTERN STAR, this being the fourth issue, is a non-profit amateur journal, featuring news and commentary concerned with the affairs of science fiction enthusiasts on the West Coast. Price 10c per issue except for those who have already subscribed, or six issues for 50c. Edited and published by Jim Kepner at 1534 Grant Avenue, San Francisco, 11 Calif. With the assistance of several members of the Golden Gate Futurian Society and the Elves', Gnomes' and Little Men's Science Fiction, Chowder and Marching Society, particularly Donald Baker Moore, Don Fabun and Tom Quinn who do the dirty work this time ... Sept. 10, 1950 new address for GGFS and WeSTar 639 Oak Street, San Francisco.